When did fudge become a health food? When it became keto. These low carb, gluten-free, dairy-free, sugar-free fudge squares are the perfect treat for busy days when you want a treat or are looking to curb a sugar craving. With a deep nutty, chocolatey flavor, they’re also packed with brain-friendly nutrients like medium-chain triglycerides and omega-3 fatty acids. Your brain loves using ketones as fuel. Luckily, this low carb fudge is packed with healthy fats from coconut oil and Perfect Keto Nut Butter, so you can satisfy your sweet tooth without the brain fog and fatigue. Both coconut oil and Perfect Keto Nut Butter contain MCTs — or medium chain triglycerides — that convert into energy and brain food quickly and efficiently. MCTs bypass the normal digestive process and convert into ATP energy much faster than other fatty acids. The quicker your body converts MCTs into ketones, the faster your brain has fuel, which is why MCTs are associated with sharper brain function. Walnuts (although an optional ingredient) can also boost brain health. Walnuts are rich in omega-3 fatty acids, which protect your brain cells and your cardiovascular system, while reducing inflammation overall[*][*]. Cacao is associated with an increase in focus and may even stimulate feelings of bliss and euphoria[*][*]. Not many desserts are good for your gut. Sugar, in fact, slows bowel transit time and can increase the number of non-beneficial microbes in your gut[*]. But these keto chocolate fudge squares won’t do that. Healthy fats from coconut and MCT oil provide anti-microbial and anti-fungal properties that may help balance gut bacteria and support your immune system[*]. Fat also aids in the absorption of essential nutrients like vitamins A, E, D, and K in your small intestine. And dietary fiber in walnuts can promote the growth of beneficial bacteria that help keep your digestive system healthy and functioning properly[*]. No need to feel guilty when indulging in these keto treats. 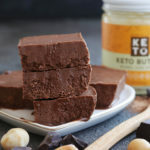 This Keto Chocolate Fudge includes ingredients associated with satiety and weight loss. MCTs in the Perfect Keto Nut Butter and coconut oil help keep your appetite in check and can help you lose unwanted fat over time[*][*]. Walnuts, too, can keep you feeling satisfied and decrease cravings for less nutritious foods[*]. If you’re on a keto diet and looking for a sweet treat that will keep you feeling full, plus feed your brain and your good gut bugs, add this to your list of go-to keto recipes. And it’s done in minutes! Add coconut oil, nut butter, and cacao powder to a bowl or stand mixer. Whip on high until very smooth and no lumps remain. Add vanilla, sweetener, and salt to the bowl. Stir in chopped walnuts or other ingredients if desired. Pour mixture into a baking dish lined with parchment paper. Place in the fridge to set. Remove and cut into portions. You can also turn the mixture into low carb, keto fat bombs by pouring the mixture into a silicon candy sheet and placing in the fridge to set.